Potato Perogies Recipe - Let the Baking Begin! This Potato Perogies Recipe with caramelized onions is simple, delicious and a perfect make-ahead dinner recipe. 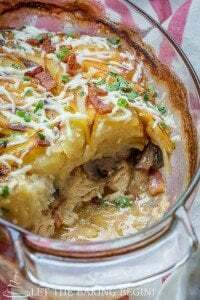 The best comfort food recipe! What is a Pierogi or Perogies? A pierogi (Vareniki) is a homemade dough dumpling filled with a mixture of your choice. This Pierogi Recipe is filled with mashed potatoes and caramelized onions. Also, shredded cheese if desired. In our family, my grandma would make these in huge batches and freeze them. Then, when we came to visit she would boil them and instantly remind everyone once again why she’s the best grandma ever. Being a Ukrainian, we called these little potato dumplings vareniki or perogie. But Polish call them pierogies. What do I serve Perogies with? Perogies can be served with butter, caramelized onions, crisped up bacon, or a dollop of sour cream. For a crispy Pierogi, once cooked you can add them to a skillet with some butter and sear until crispy. Crisping up in the skillet is a great way to reheat the pierogies next day. This Pierogies Recipe is the perfect make-ahead meal. The Pierogies freeze nicely and are ready to be cooked when you are. Comfort food at its best! When I make this Pierogi Recipe I love to double or triple the recipe and make a whole bunch to freeze. To freeze, just place the Perogies on a floured tray and freeze them. Then, transfer into Ziploc bags and store for up to a month (for best results). Whenever you are having a busy day or when your just not in the mood to cook all you need to do is boil the frozen Perogies and dinner is ready in minutes! What is the best way to cook frozen Perogies? Once you have your Perogies made and frozen, the hardest part is done. All you need to do is bring a large pot of salted water to a boil then, add the amount of perogies desired and cook for about 4-5 minutes after the Perogies float to the top. Drain and add to a bowl. Add butter and gently toss to coat. Then, enjoy your delicious and simple perogies dinner. In a bowl of a mixer fitted with a hook attachment, combine milk, egg, salt, and 3 cups of flour. Mix on low speed until thoroughly combined. Add 2 more cups of flour and mix until combined, once again. Now add the butter and knead until dough is smooth and doesn’t stick to the bowl, about 3-4 minutes. Cover and let rest for 30 minutes to 1 hour. Saute diced onions over medium heat in some oil until golden. Remove onions from skillet, leaving oil behind. Boil peeled & quartered potatoes in salted water until soft easily pierced with a fork. Mash the potatoes with the potato masher. Add half the caramelized onions, 2 Tbsps of oil from skillet, garlic powder and black ground pepper. Mix until combined. The potatoes should keep together in a small lump if pressed together, if they do not, add a little more oil from the caramelized onions. After dough has rested, split it into two. While working with one half, cover the other half to prevent drying. On a well-floured surface, roll out the dough to about 1/8 inches thick. Sprinkle with flour to prevent sticking. Cut out 3-inch circles with a cookie cutter or an upside drinking glass with the same diameter. Collect the scraps around the cut out circles, combine into a ball and return it to the other half of the dough. Put about 1.5 full teaspoon of potato filling in the middle of the dough circles, leaving room around the edge of the circles to seal. This mini scoop is perfect for dispensing the filling onto the pierogie dough. Fold the pierogi in half, pinching the middle. Then starting from the right side, pinch the two side together firmly, going along the ‘rim’, until a half-mooned shape is achieved. Set the formed Pierogies on a floured surface (or baking sheet if you plan to freeze them). Bring 4 quarts water and 2 tbsp salt to a boil over high heat. Next, add the perogies in batches of 20-25 perogies. Stir with a spoon to prevent them from sticking and cook about 4 minutes past the boiling point. To check if they are ready, remove one from the water cut it in half ahd taste it. Remove Perogies from water with a colander, add to a bowl. Mix with some butter. Sprinkle the remaining caramelized onions on top. Serve with a dollop of sour cream (optional). 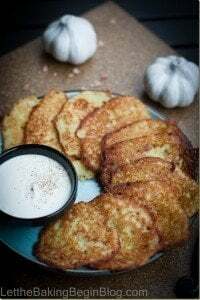 Our family loves this Pierogi Recipe, we especially love the Caramelized Onions and Potato filling. Whenever we have Perogies for dinner all the plates are licked clean! This is the perfect comfort food recipe. I hope you enjoy it as much as my family does. Now tell me, what is your favorite Pierogi filling? Meat Piroshki Recipe – Dough stuffed with a meat filling, then fried to perfection! Cherry Dumplings – Dumplings filled with cherries. 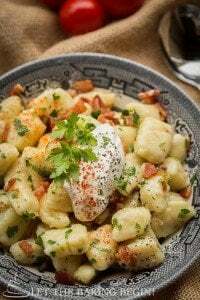 Fluffy Gnocchi or Lazy Pierogies – Perogies made simpler. 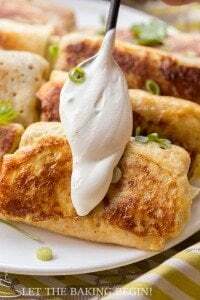 This Potato Perogis Recipe with caramelized onions is simple, delicious and the perfect dinner recipe. Having a batch of these perogies in the freezer means comfort food is only minutes away from enjoyment. In a bowl of a mixer fitted with a hook attachment, combine milk, egg, salt, and 3 cups of flour. Mix on low speeds until thoroughly combined. Add 2 more cups of flour and mix to combine. Add room temperature butter/margarine and knead until a smooth dough that doesn't stick to the sides of the bowl forms. Cover with kitchen towel and let rest for 30 minutes to 1 hour, at room temperature. Meanwhile, make the caramelized onion and potato filling. Add couple tablespoons of oil to a hot skillet, put the diced onions. Stir with a wooden spoon until nicely caramelized. Remove from heat, tilt the pan to the side, and bring the onions to the raised part of the skillet, allowing the oil to pool at the bottom. Boil peeled & quartered potatoes in salted water until soft easily pierced with a fork. Do not overcook, this will make the filling too runny. Mash the potatoes with the potato-masher. Add half the caramelized onions (plus about 1-2 tablespoons of oil), garlic powder & freshly ground pepper. Mash again to combine. Add more reserved oil if needed. The potatoes should not be fall apart crumbly and should keep together in a small lump if pressed together. You can add a couple of tablespoons of milk, instead of oil. Do not add too much liquid. You do not want the filling to be runny, because it will be even runnier when Pierogies cook in water. When the dough has rested. Split it into two halves. While working with one half, cover the other one with a kitchen towel, to prevent drying. Form a ball and set it on a well-floured surface. Roll out the dough on a well-floured surface to about 1/8 inches thick, lifting the dough and adding more flour as needed, to prevent it from sticking to the working surface. You can sprinkle the top too to prevent the rolling-pin from sticking. Try to add a minimal amount of flour. Cut out 3-inch circles with either a cookie cutter or an upside drinking glass. Collect the scraps around the cut out circles and bring into a ball. Knead it for a couple of seconds and add it to the other half of the dough. Put 1 full teaspoon of the potato filling in the middle, keeping it together as much as possible. You do not want the filling to touch the sides of the dough, or it will not stick together when you try to form the Pierogies. To form the Pierogies, bring the two opposite sides together, pinching in the middle. Then starting from the right side, pinch the two sides together firmly, going along the ‘rim’, until a half-moon shape is achieved. Set the formed Pierogies on a floured surface (or baking sheet if you plan to freeze them). Freeze the Pierogies on a well-floured baking sheet for about 3-4 hours. Then transfer to a ziplock bag and store in the freezer for up to 1 month (for best results). When ready to cook, do not thaw, just add frozen Pierogies to boiling water & go ahead with the instructions below. Bring 4 quarts water & about 2 tablespoons salt to a boil over high heat. Once boiling, cook Pierogies in batches of 20 – 25 Pierogies, by dropping them into the water & stirring with a spoon immediately to prevent them from sticking. From the time the water comes to a boil again (and the Pierogies have floated to the top), cook for 5 minutes, or until they are soft, but still hold together. Do not overcook, or they will become a bunch of mush. While cooking, add 1 tablespoon of butter to a large bowl. Remove Pierogies from the water with a colander, allowing all of the water to drip off before adding them to the bowl. Let Pierogies sit over the butter for about a minute, then carefully shake to coat in butter. This will prevent them from sticking to each other & add extra flavor. To serve: Sprinkle the remaining caramelized onions on top. Serve with a dollop of sour cream (optional). Meat Piroshki Recipe - Let the Baking Begin! Marina, these вареники are so yummy. I have a question! Would you recommend to make the same kind of dough for dumplings? Thanks a lot for everything you do here for us!!! When you say dumplings, do you mean pelmeni? If so, yes, I use the same dough for both savory and sweet vareniki or pelmeni. Thanks Marina! That’s my next adventure to make pelmeni with the recipe you provided. If you could share the meat filling you have for pelmeni, please! I already know it’s going to be delish. Thanks againg, and have a wonderful day! In Poland, to the dough we use only flour and warm water, then we add salt to the boil water. It should be made by hand, not mixer. You use to much ingredient’s. It’s not tradicional recipe. As to the recipe, each family has their own traditional recipe this is how we made it in our family 🙂 it doesn’t mean that everybody has to follow it though. After boiling, we put them into a pan with browned butter and crispy speck and give them a very quick fry. Soooo tasty. We are Polish also but have modified from the traditional recipes, as the old Polish did the best they could with the limited ingredients that were available during the war (so some things are quite bland). Our Golabki is better than any you will ever find lol. I do crisp them up in the skillet too sometimes. I’ve heard people cooking them in skillet from the beginning, with no prior cooking… I should try that too. I have made these many times over the years, time consuming but well worth it! My mom was from the old country and these were a staple for holidays, especially Easter. We have always mashed cheese into the potatoes and nothing more also cook, pour melted butter and caramelized onions, before freezing them into zip-lock bags, delish! Yes these are pretty awesome 😀 So do you cook yours before freezing them? Marina, you are really becoming my favorite food blogger. I find myself always going to your site for recipe inspirations. I am also looking forward to making these pierogies! I have been craving them since the day I got pregnant (and I am 6 1/2 months pregnant now!) Thanks for the amazing recipe!!! Wow, thank you Oksana, it’s truly an honor to hear something like that. Thanks for using my recipes and visiting my site! Congratulations on your pregnancy, who are you having?